New Year’s Eve is hands down the most popular time for celebrating with great cocktails and champagne. So Nicky and I would be remiss if we did not mention a few of the celebrations and libation options around town for New Year’s Eve. Accessed by secret code through a vintage phone booth, Prohibition is one of our favorite places for classic handcrafted cocktails. Complementary hors d’oeuvres will be served from 5:00 to 8:00 p.m., and a champagne menu is being offered. 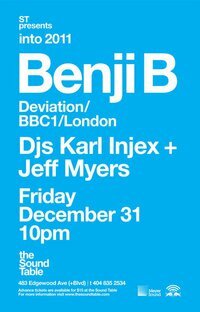 The big news here is that Benji B (Deviation/BBC1/London) will be making his Atlanta debut at The Sound Table. A unique and globally reknown DJ, Benji B seamlessly draws from several genres at once. He hosts his own show on BBC Radio 1 and runs Deviation, one of London’s most successful club nights each month. The fun starts at 10:00 p.m. with Benji B along side Karl Injex and Jeff Myers. Advanced tickets are available and holiday cocktails are on the menu. Ever wanted to live like James Bond for a night? Restaurant Eugene and Holeman & Finch Public House are teaming up to present an unprecedented dining event. 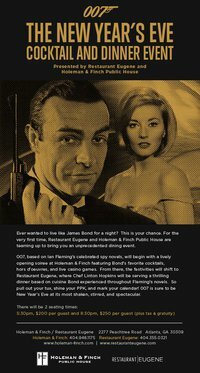 007, based on Ian Fleming’s celebrated spy novels, will begin with a lively opening soiree at Holeman & Finch featuring Bond’s favorite cocktails, hors d’oeuvres, and live casino games. From there, the festivities will shift to Restaurant Eugene, where Chef Linton Hopkins will be serving a thrilling four-course dinner based on cuisine Bond experienced throughout Fleming’s novels. So pull out your tux, shine your PPK, and mark your calendar! 007 is sure to be New Year’s Eve at its most shaken, stirred, and spectacular. Two seatings: 5:30pm, $200 per guest and 8:30pm, $250 per guest. Our friends at Sauced are offering two seatings for a four course prixe fixe menu and cocktail/wine pairing. The cocktails here are amazing, so a pairing with some of Ria’s awesome food will be a night to remember! Reservations only, so call today! In addition to some great cocktails, Café Circa will offer two seatings for a three course prixe fixe menu. There will be a live DJ, champagne toast and party favors. Reservations required. If you are looking for an intimate, hip, stimulating environment for NYE, then avoid the masses and endless lines by slipping into Cru. You will enjoy creative cocktails, delicious food and champagne flowing all night. No cover. Beginning at 9:00 p.m. revelers are invited to listen to DJ Andre Perry spin the best hits of the decade as they enjoy performances from the Dames Aflame, fire shows by the Hot Toddies, go-go dancers, a snow machine, contortionists, aerialists and two balloon drops. There will be a complimentary champagne toast at midnight. Winter white attire is encouraged. Come ring in the New Year with Yacht Rock! This is an all inclusive event with drinks and your food covered all night and into the wee hours of the morning. This party sells out quick so get your tickets online now. For a classy night of cocktails and fabulous food, head out to P’cheen. 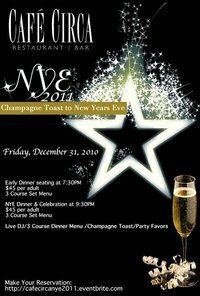 There will be no cover for the night, luxurious dinner specials, opulent libations, free late night buffet for those arriving before midnight, dancing and a champagne toast at midnight. Reservations strongly suggested. No cover at Diesel for the celebration. A “dirty balloon drop” will take place at midnight along with a complimentary champagne toast. The folks at Fifth Group are offering several prix fixe dinners for the evening. South City Kitchen Midtown and South City Kitchen Vinings will offer a three-course prix fixe for only $39.95 featuring some of their fabulous southern-style creations and their fabulous cocktail list. La Tavola will offer a three-course Italian dinner for $49. We recommend any of the grappas or the lemoncello! 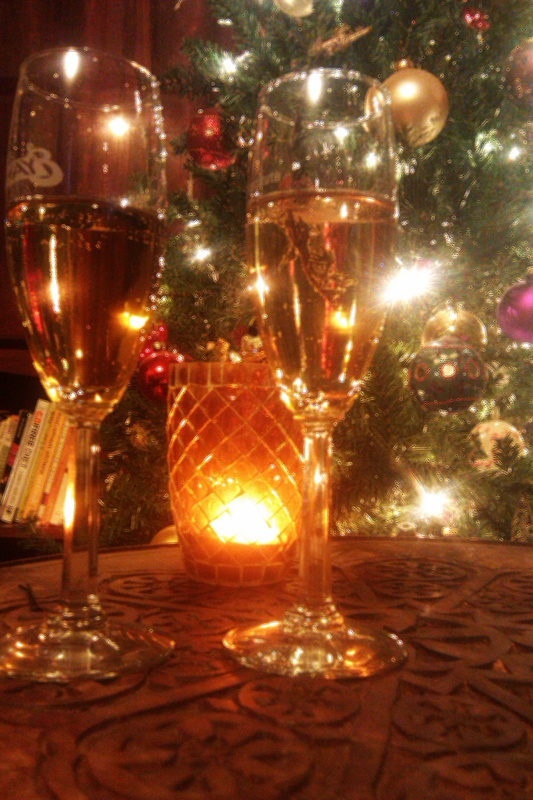 Enjoy a delightfully libatious New Year’s Eve and remember to always practice safe imbibing! Slainte!